It’s not uncommon for trees to get chopped down. This isn’t often a somber event, but rather an inevitable one if the tree incurs disease or injury and can’t recover. It may have even become dangerous for homes or other nearby structures. Once a tree is felled, all that’s left is a stump, and that’s not always a good thing. While stumps can become fun decorative elements, a reading chair, or even an imaginary ship as the kids pretend the ground is water, they are also dangers. Roots jutting out might pose a tripping hazard. Disease may be passed from the stump to nearby growth. Even pests can still emerge as an issue in your stump. One such situation occurs when you get termites in a dead tree stump. As you may have heard, termites eat wood, so if they live in your stump, they might just meander over to your home or business, right? It’s possible. 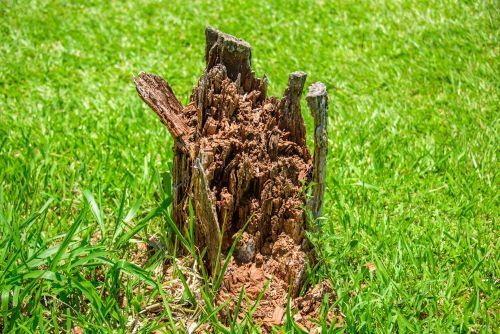 Here’s what you should know if you suspect termites have infested dead tree stumps near you. There are two main types of termites: subterranean and drywood. As you might suspect, since drywood termites require less moisture to survive, they are often the ones you’ll find in attics and, you guessed it, dried trees and stumps in your yard. Thankfully, they live in smaller colonies than the subterranean ones so often cause less damage. Subterranean termites are those most often found in homes and that cost owners millions in damages every year. The workers are cream colored, 3–4 millimeters long, and often only seen when infested wood is broken into. The ones you need to look out for, though, are the swarmers. These are dark brown or black in color and around 4 millimeters long. They might also have wings, a clever disguise, as people often think they are flies at first. While subterranean termites are the terrors to appease, drywood termites cause chaos as well. But while they might infect your stump, they won’t likely infest your property if your home is more than 20 feet away. If you do see drywood termites, they’ll be a creamy white or light brown color and up to one-inch long with six legs and antennae. Just because the termites infesting your dead stump are drywood termites does not mean they won’t travel to your space. And if they do make their way, havoc will ensue, as they enjoy consuming support beams, floors, and walls if the conditions are right. And while drywood colonies are smaller than the subterranean colonies, you’ll still find the drywood in packs of up to 2,500. That’s nothing to laugh about. Your home is most susceptible if you have small cracks and crevices that can provide easy entry or if it’s a nice, warm sunny day. In the Portland area, that makes spring the time to react. If you suspect termites or want to avoid them altogether, take the following action. If you think you notice termites in a dead tree stump, the best course of action is stump removal, and at Mr. Tree, that’s one of our specialties. This is done through a process call stump grinding. Stump grinding involves a large, loud machine chipping away at the stump until it literally grinds it down into bits of mulch. We make sure to grind 10–12 inches below the grade to ensure its base and roots are completely removed, and after, we refill any remaining hole. Then we clean up and leave you to your stump-free, termite-free yard. We’ll have your landscaping looking pristine in no time with this fast, effective service. If you don’t want to remove your stump, regardless of suspected termites, this is what you’ll notice if they have infested your space. Termites are not quiet. They love eating your wood and make a racket, so at some point, you will likely hear them, maybe even before you see them. Not sure if what you hear is termites? Play some rock music, as it’s been found that they will work faster while listening to these tunes, just like humans, upping their noise as well. No, as it turns out, ants are not white, but other traits are so similar that they can be easily misidentified as termites. You can tell the difference by noting several differences: termites have straight antennae rather than bent, a termite’s midsection is larger, and the termite’s wings are the same size (if they exist). As a reminder, white ants do not exist, so that’s likely a termite. Are your windows or doors suddenly stiff or warped? It could be due to the damp, warm weather that’s arisen, or it could be termites. They produce moisture when they work, leading to similar wood conditions. If this is happening to you, don’t make an assumption. Make sure it’s not caused by termites. Drywood termites do not use their excrement to build tunnels as subterranean ones do, so if these pests have infested your space, there will be evidence. At some point, you’ll likely see small black markings or a dark powdery substance near their tunnels if they make their way into your home. Termite infestation in tree stumps is totally normal and nothing to fret about. But if you do notice termites in a dead tree stump, then action should be taken to ensure the safety of your surrounding property and landscaping. The best solution in this situation is stump grinding, one of many services offered at Mr. Tree. But knowing what to look for when it comes to termites is essential. Immediate identification could save you thousands in damages.